1/2'' DRIVE 11 PIECE METRIC 6 POINT DEEP IMPACT SOCKET SET is rated 5.0 out of 5 by 5. Rated 5 out of 5 by farmboy22 from good set. Great high vis markings on the sockets make it easy identify the sockets under a truck. Never had them slip or tear up a nut or bolt. Rated 5 out of 5 by kod54man from 1/2 Impact This is a great set. Never have had to warranty a socket. the 10,11,and 12mm are a bit useless in a 1/2 inch drive. Rated 5 out of 5 by Kyle19 from This product has many great features. 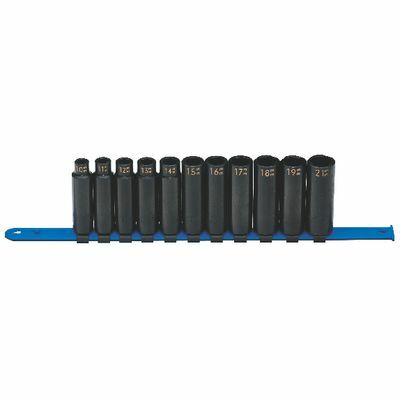 This is a well made impact socket set, that covers a lot of the sizes you will need on the job. Rated 5 out of 5 by DonJuan from Great Socket Set at an Amazing Price The laser markings make these sockets very easy to read. They get the job done.